This period of political ferment began with the economic crisis of the Great Depression of 1929, which devastated Americans’ lives, and intensified the period’s racism and antisemitism. American foreign policy was shaped by competing views of the nation’s relationship to the world as fascism and dictatorship took hold in Italy, Japan, Germany, and Spain, from the mid-1920s and throughout the 1930s, resulting in WWII. The United States Senate demanded complete neutrality and isolation, while President Franklin D. Roosevelt sought greater support for Britain and European allies. Minnesota was an epicenter of the politics of the 1930s when the Farmer-Labor Party, one of the nation’s most successful progressive third parties, was victorious in electing dozens of statewide and local officials, and controlling the governor’s office from 1930–1938. Some Republicans, the other dominant political party, which favored business and capitalism, sought to purge left-wing politicians, union activists, and progressive students and faculty from public life, and accused them, no matter what their views were, of being un-American Communists. In 1929, the crash of the stock market abruptly transformed Americans’ lives. In October of that year unemployment stood at three percent. By 1931, 25 percent of the workforce was unemployed. The poorest areas of Minneapolis faced much greater unemployment. On Minnesota’s Iron Range, iron ore mining districts around Lake Superior, it was as high as 70 percent. Combined with drought in the Great Plains, the region and the state faced poverty, hunger, and unemployment, as did the nation, on an unprecedented scale. 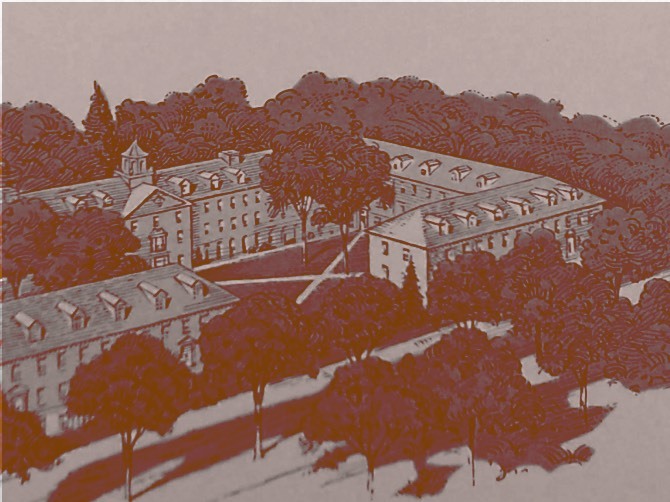 Campus life was remembered by two former students. Eric Sevareid, an undergraduate and activist at the University of Minnesota from 1934–1936, recalled the Depression. [In 1933] We observed bread lines from the street car as we went to school carrying the books that described the good society. We duly listened to lectures on orthodox economics, which explained the “natural laws” of capitalist competition, which would, if not interfered with, ultimately produce the general good by permitting everyone to pursue his selfish ends unhindered. And every day the headlines spoke of riots, of millions thrown out of work, of mass migrations by the desperate. All of this was happening in the richest country on earth, a country that possessed all the political rights and instruments by which free men could change their condition-and still they could not prevent this…The system did not work, and if it did not work in America it certainly would not work anywhere. Rosalind Matusow Belmont, a student at the University and activist during the 1930s, described her memories of the period on campus. There were some fraternities, but the majority of students at that time were pretty much from pretty low income families and (they had) an alliance, an identification whenever there was some kind of a labor activity. I remember later on when Strutwear (a knitting works) went on strike (in 1935), and some of the other strikes occurred, the students were interested and they wanted to go down to the picket lines and they wanted to find out what was going on, they were very much interested. Most of the students were trying to find a way to keep going to school, a lot of the students worked, a lot of the students worked in cafeterias so that they’d be able to get their meals as a way of working. [We would go to the] White Castle, where you could get six hamburgers for 25 cents and we used to go in you know and get six and split, but everybody was very, very poor, people did not have money, there was a streetcar, we thought it was spending too much money to take the streetcar, and we hitchhiked to save a nickel. Everybody around me that I can remember was having a lot of trouble with money, even in the University dormitory where I went the first semester. Most of the people who lived there at the University were farmers’ daughters you know, and I can remember they made their own clothes and most of them were working part-time to be able to make it through college. It was you know, and people didn’t have jobs. Rosalind Matusow Belmont. Minnesota Historical Society, 20th Century Radicalism in Minnesota Oral History Project 1972-1989. Pages 6-7. (http://collections.mnhs.org/cms/display.php?irn=10469031). Minnesotans responded to the Great Depression in part by voting into office in the 1930s governors, senators, congressmen and city-level officials affiliated with the Farmer-Labor Party, one of the nation’s most successful progressive third parties. It never controlled the State Senate of the Minnesota Legislature. Its roots go to the 19th century, but the party developed from 1917 through the 1930s and began to lose strength by the early 1940s. The strong coalition between workers and farmers grew as a result of unemployment and poverty. It brought a new enthusiasm for the party platform that included funding for building roads, relief from farm foreclosures, and the creation of a state income tax to finance employment. Its leaders were anti-corporate and pro-organized labor. They advocated for many of the programs that would be introduced by the New Deal, including Social Security and the right to organize unions. There were three Farmer-Labor governors between 1931 and 1938: Floyd B. Olson, who served from 1931 to 1936, Hjalmar Petersen, who served from 1936 to 1937, and Elmer Benson, who served from 1937 to 1939. Olson and Benson had a substantial impact on the University of Minnesota. Republicans in state politics, as well as Republican administrators on campus, were in constant conflict with the vision of the Farmer-Labor movement. Richard M. Valelly. Radicalism in the States: The Minnesota Farmer-Labor Party and the American Political Economy. Chicago: University of Chicago Press, 1989. This 1928 poster marked the alliance of two Progressive political parties that were committed to the rights of workers and farmers in Minnesota. This 1928 poster marked the alliance of two progressive political parties that were committed to the rights of workers and farmers in Minnesota to earn a decent living. 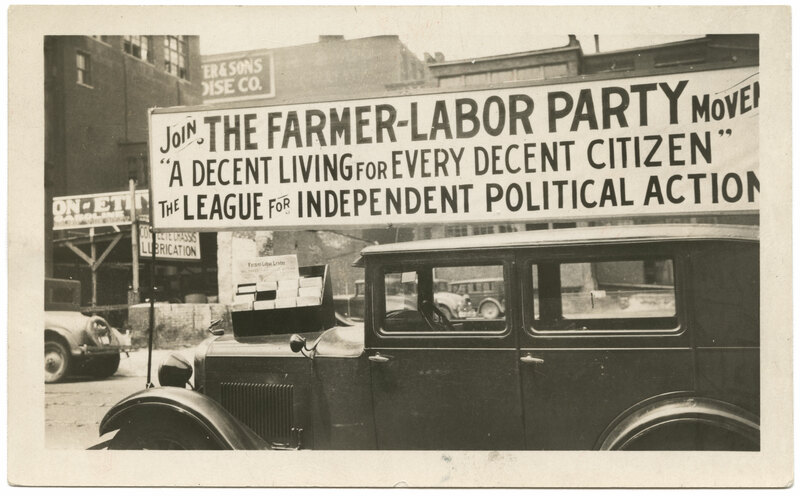 From 1930-1938 the Farmer-Labor party was the most successful state-level third party in the United States. It controlled the governorship, senate, and house seats, and many positions in city government. World War II formally began in 1939. The rise of fascist states in Europe, however, began far earlier, and the question of war dominated the decade until the United States declared war in 1941. Much of the decade was taken up with the question of whether the United States would join the fight against the enemies of democracy. Throughout the 1920s and the 1930s the majority of Americans opposed war and embraced “isolationism.” Anti-war factions of the period in the United States included both the Right and Left wings of American political life. The America First Committee, whose hundreds of thousands of supporters centered in the Midwest and included Nazi supporters, conservative businesspeople, and antisemitic populists, opposed any form of intervention in global relationships. At the same time, Left-wing activists were anti-war as well. Pacifists opposed all war on principle. Progressive activists believed that WWI enriched bankers, industrialists, and capitalists, and that could be the only motivations for war. Overall, little could shake politicians during the mid-1930s from isolationism, despite the rise of fascism, Germany’s invasion of its neighbors, Mussolini’s invasion of Ethiopia, and Japan’s invasion of China and attack on an American ship. Nazi persecution of Jews beginning in 1933 moved remarkably few non-Jewish Americans, and the news of Nazi death camps and the extermination of Jews, as well as Roma, disabled and gay people, also seemed to have little effect. Popular opinion did shift at the end of the decade as the theaters of war and international alliances changed. In 1940, after the Nazi occupation of France, Belgium, Norway, Holland, and Denmark, many Americans questioned neutrality. When the United States entered the war in 1941 after a Japanese attack on Pearl Harbor, most, but by no means all, of the opposition ended. Ira Katznelson. Fear Itself: The New Deal and the Origins of Our Time. New York: W.W. Norton, 2013 pp 290-301. In the 1930s, the United States Senate took an isolationist position against any kind of U.S. involvement, which left allies vulnerable. A Herb Block cartoon from 1935 satirizing the isolationist, anti-war position of interwar U.S. Senate. 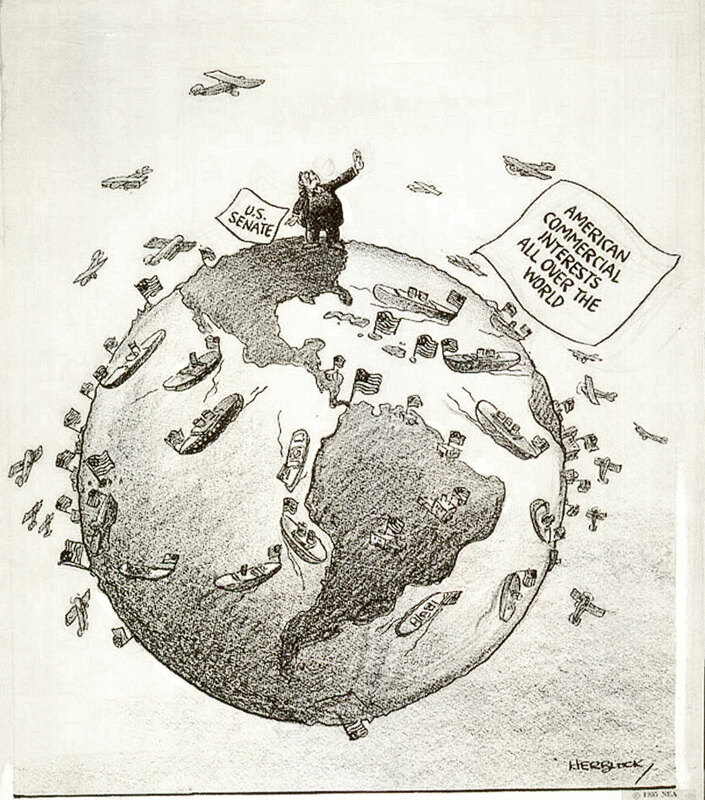 The drawing includes a defiant politician in Washington, D.C., oblivious to the numerous commercial ships and airplanes that continued to entangle the US with the fate of the wider world. In the 1930s, the United States Senate took an isolationist position against any kind of U.S. involvement in international engagements, ranging from refusal to join the World Court to the passage of the various Neutrality Acts, which left allies vulnerable. 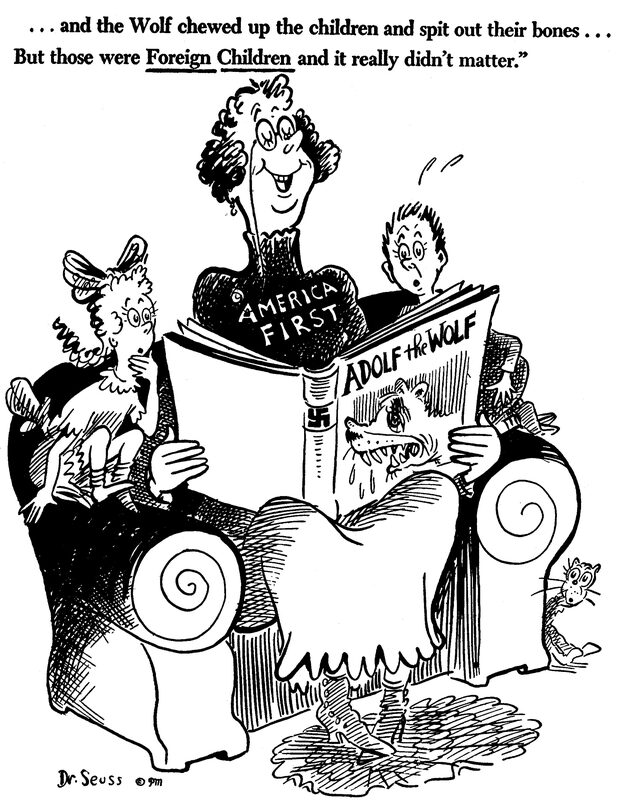 This Theodor Seuss Geisel (Dr. Seuss) 1941 cartoon appeared when isolationism was losing popularity among Americans. 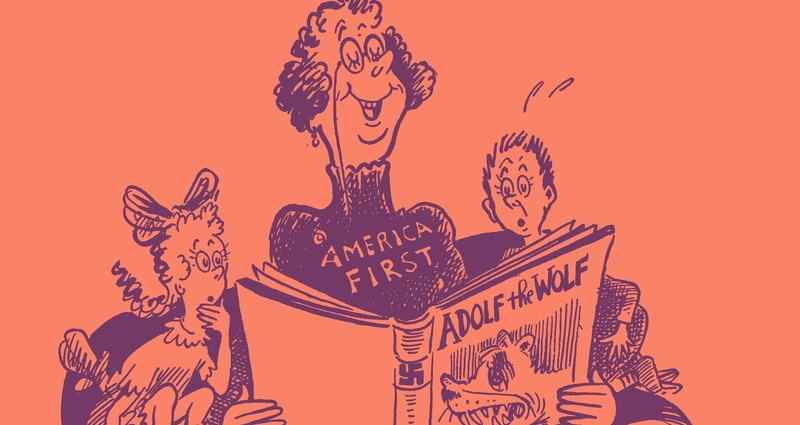 “And the Wolf Said” is a cartoon penned by Theodor Seuss Geisel (Dr. Seuss) in 1941, when isolationism was losing popularity among Americans, who expressed increasing concern for allies suffering from Nazi aggression.This now-famous Dr. Seuss cartoon satirized the isolationist “America First” movement of the 1930s and 1940s, highlighting its nativist underpinnings and moral absurdity. The anxiety over communism and who was a communist dominated the decade. The Communist Party of the United States was involved in the struggle for African American rights, student activism, and the labor movement. However, many left-wing activists were not communists. Accusations of communism became a slur used against virtually anyone critical of capitalism or corporate power. The FBI was empowered to investigate subversives during the 1930s. Director J. Edgar Hoover focused primarily on people and groups he considered communists and barely attended to Nazis. In this period of student activism on campus it was not illegal to hold the views that led to administrators spying on left-wing students. Larry Ceplair.. Anti-Communism in Twentieth-Century America. Santa Barbara: Praeger Press, 2011.